ONLINE DATING IS HARD... LET US DO THE WORK. TAKE THE STRUGGLE OUT OF ONLINE DATING. ONLINE DATING DOESN'T HAVE TO BE SO HARD. WE DO THE WORK... YOU GO ON THE DATES. Are you tired of being single when all of your friends seem to be paired up? Does it feel impossible to know what to write in an online dating profile or message? Does putting the time into online dating often feel like another full-time job? If this sounds like you, then you might just need A LITTLE NUDGE. Do you want a free one-on-one phone consultation to see if our services are right for you? It's important to stand out from the crowd. Get a professionally written profile that shows people what makes you special. No time to search online? That's okay. Have potential matches selected for you by our team, based on your preferences. Don't let the daunting task of writing that initial message get you down. Save your time and creative juices by letting us write them. Save time by having your dates planned for you. All you have to do is show up and enjoy yourself! Just like a sports player has a coach, a dater should, too. Identify questions and obstacles to make sure you're on the road to success. 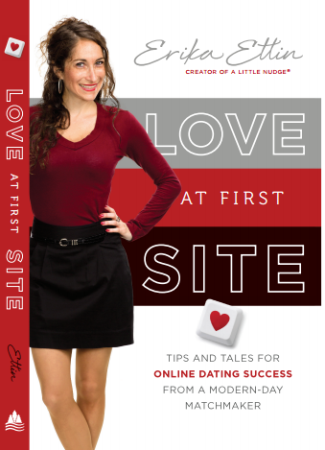 Get the #1 book on online dating, written by Erika Ettin herself. In Love at First Site, dating coach Erika Ettin has taken her expertise—previously only available to her clients—and laid it out in an easy-to-use and exciting guide to the world of online dating. Erika shows her readers how to increase their odds for connections by marketing themselves well. Her background in economics helps her use the numbers game in her favor. It’s a simple equation: more profile views equal more dates, more dates equal a better chance at finding your match. With her tips and tricks, Erika can show you exactly how to increase your online dating odds. Erika’s advice includes pointers for choosing your best profile picture, writing a winning profile, crafting emails that catch someone’s attention, and planning the first date. Erika’s knowledge is rooted in her highly successful coaching business as well as her own experience with online dating. Questions from Erika’s clients will save you the time of wondering how to approach strange situations—they’re all in here! And tales of dating adventures from Erika herself will leave you both encouraged and entertained. Want to get your hands on the first chapter for free? Just click below. Give me Chapter 1 for free! "I worked with Erika on the Platinum Package, and to say that it was a successful experience would be an understatement. Holly and I are going on a trip to Italy and Spain this week, and my kids seem to want to spend more time with her than they do with me! ... She said yes! She's amazing! She's incredible! I would have never asked her out without you. Thank you! Thank you!" "I'm one of your success stories. [He] and I celebrated our six month anniversary and just got back from a 10 day trip to the Caribbean. Thanks to you we are one happy couple!!"